But newer on the animal assistance front—and more murkily defined—are emotional support animals, ranging from dogs and cats to hamsters and birds. These animals are not required to go through special training or gain any certifications—they only need be recommended by a doctor or a therapist. Their numbers appear to be growing—United Airlines reported that it carried 76,000 such animals in 2017, up 77 percent from the year before—along with arguments about whether they are necessary, and problems like people trying to bring them along for bogus reasons, and fellow customers or travelers being bitten or otherwise harmed. So how should small businesses triage these situations? They need to strike a balance between accommodating those who have emotional needs or other disabilities, on one hand, and the safety and cleanliness of their environments, on the other. They also need to sniff out fraudulent claims of emotional need, especially in cases where the human in question has a financial incentive to do so, such as moving into an apartment building that charges extra fees for pets. Apartment building managers have reported cases in which residents appear to have made claims of needing emotional support to get fees waived, while other residents sometimes become upset if they’re let in, especially if those residents have moved into a particular building in order to avoid dealing with other people’s pets for reasons like bad allergies. Also notably, dog trainers have reported an upsurge in inappropriate-sounding requests to certify dogs as emotional support animals. 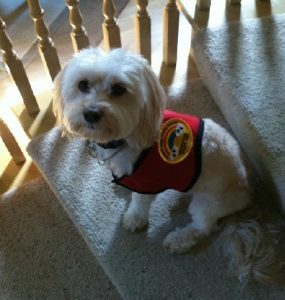 Some have decided to stop training service dogs as a result, while others simply keep their antennae raised and push back when they get questions like, “How do I get my dog to be a service dog?” This tends to suggest ulterior motives, which people usually admit upon further questioning. Yet companies like Walmart and American Airlines have entered into undisclosed settlements in lawsuits stemming from incidents in which people with disabilities were denied the ability to bring their service dogs with them. To prevent such situations, the Illinois attorney general’s office has recommended that businesses err on the side of being inclusive—not only to avoid a lawsuit but to keep from denying service to a person who actually has a disability. Bottom line, it’s worth keeping in mind that at least some of those with emotional support animals have legitimate reasons, such as reducing paralyzing levels of anxiety. Even some business owners who have particularly legitimate reasons for concern, such as grocery store owners concerned the health department might shut them down if they allow such animals, have decided to maintain an open-door policy. There might not be a precise right or wrong answer, but your business’ policy on this emerging issue does need thoughtful deliberation based on the goods and services you provide, your overall environment, and your customer base.